Here is the almost finished design for a very cool couple getting married in August. Lora and Frank have been together almost 12 years and are finally tying the knot. They really wanted a colorful and very mod wedding invite. 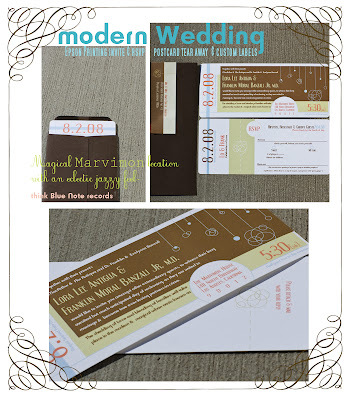 Since they are getting married at the very eclectic Marvimon House in downtown Los Angeles it needed to be a very unique invite. We chose to do a Blue note record theme. As we have some final details to go over, I am pretty sure this has captured that feeling. I know this because when I showed it to my 10 year old niece she said to me "This is Jazzy!" So there you have it... it is a modern Jazzy feel exactly what they wanted! This invite is a tea length with a tear away rsvp postcard. It is Epson printed on Cranes 100% cotton 300 gsm letterpress paper. perfect for letterpress and gorgeous for Ink Jet!